One useful way to document abstractions and subpatchers is to add assistance text to inlet and outlet objects. Once you document and inlet or outlet, the assistance shows up in a bubble or in the Clue window when you move the mouse over an inlet or outlet object. Select an inlet or outlet object in your abstraction or subpatcher. 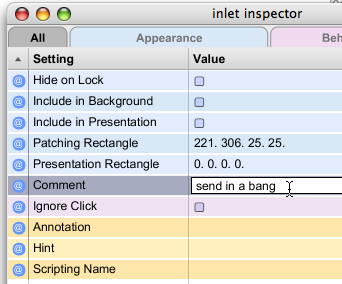 Click the Inspector button on the Patcher toolbar to show the object's Inspector. Double-click in the Value column for the Comment setting to show a cursor and text box. Type in the assistance string information followed by a carriage return. The Value column will be de-selected, and you will see your text when you position your cursor over the inlet or outlet in any patcher that contains your abstraction if you have Assistance enabled.